In early September, members of the media were barely paying attention to the vague, lefty Hooverville-campout thingy called Occupy Wall Street. By early October, its protesters had coalesced around a theme: "We Are the 99%" (who disapprove of greed, corruption and the disproportional power held by the richest 1%). And the movement spread from Manhattan: seemingly overnight, there were Occupy Boston, Occupy Los Angeles and Occupy Chicago. And then Occupy London and Occupy Hong Kong. People were even "occupying" Antarctica, and late-night talk-show hosts cashed in on occupy jokes. ("Earlier this week, a protester at Occupy Wall Street proposed to his girlfriend," Conan O'Brien said. "His exact words were, 'Will you occupy my parents' basement with me until I get a job?' ") That sort of nationally broadcast mockery was a sign of just how big the movement had gotten. 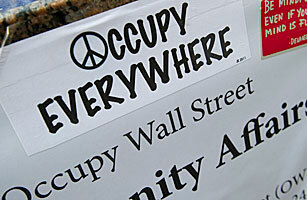 In 2011, occupy became this generation's sit-in, a word connoting peaceful but uncompromising objections to the status quo.